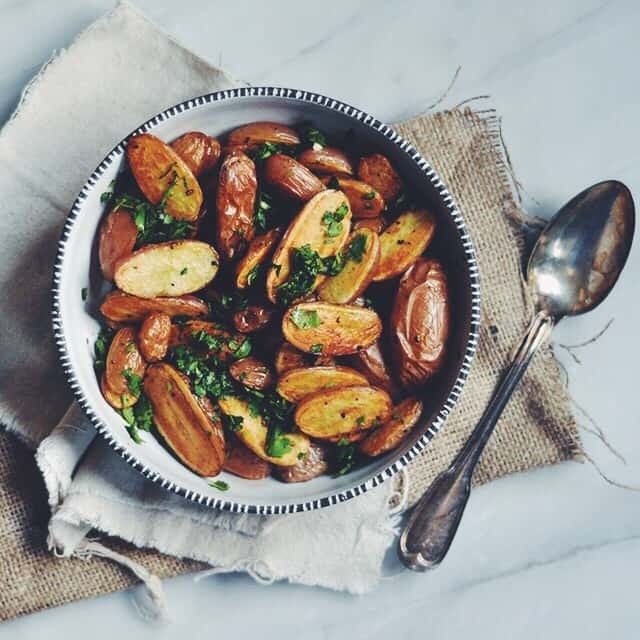 I’ve never met a potato I didn’t like but my very favorite kind has a particularly crispy skin. I especially love when the top bubbles up a little, like a thin piece of parchment paper, tenting the soft center. And oh when you bite through the crust and reach the creaminess inside — it all sort of comes together, you know? 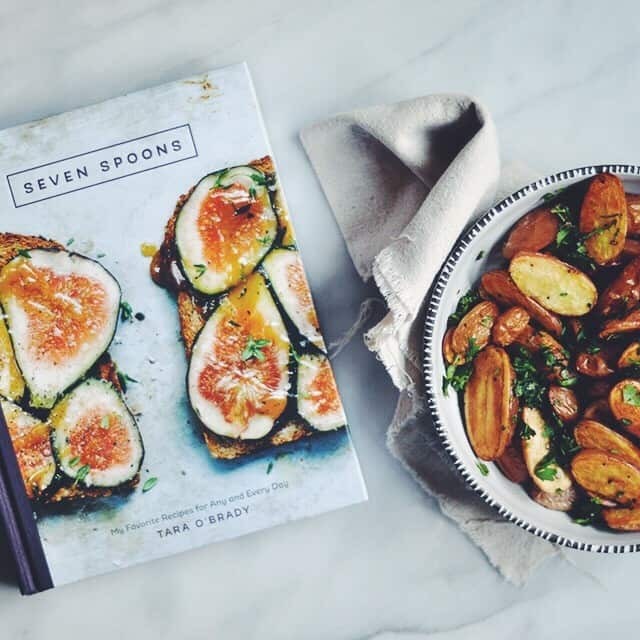 Whether dipped in butter, ketchup, or blue cheese dressing (as Tara suggests in her new book, Seven Spoons), it is the sort of side dish that could easily become an appetizer. Tara’s was one of the first food blogs that became regular reading for me (among them, Orangette, Chocolate & Zucchini, and Smitten Kitchen). It is her voice that captured me, and her images, too. The way she’d describe simple, everyday exchanges, or the very mundane things most of us take for granted — like an afternoon spent at home during a snowstorm. I’d read and re-read her posts, trying to pinpoint what it was exactly that elevated these stories into feelings. I’ve been dealing with a lot of feelings lately and I’ve mostly been hiding them from you. After spending a frustrating (and unsuccessful) year trying to buy our first house in the Bay Area (who were we kidding?! ), we’d just about thrown in the towel and decided we’d probably die in our tiny apartment because that’s sort of how things are in the Bay Area these days (you either leave or die in your rent-controlled apartment). And then I learned I was pregnant. We were excited. We’d always talked about being a family of four not too far into the distant future and things were going pretty well according to plan (except the damn housing stuff). Nearly two months passed and then the day before Matt flew out to SXSW (to host our very first showcase, no less), I asked him if he wanted to come to my first ultrasound. I must have had a feeling. We’re having twins. It wasn’t in the plans. But are these things, ever? So here we are. I can’t say that I’m not completely paralyzed by fear of what the very near future holds — where we’ll live, how we’ll afford childcare in the most expensive city (region?) in America, when we’ll sleep again (?). Don’t get me wrong, these feelings are weirdly mixed. The fact that I’m growing not one but two babies in my belly is pretty thrilling — I’ve always sort of liked the idea of having twins (two for the price of one! ), but once we had Neko I wondered in horror how anyone goes from one to three without completely losing oneself in the process. I’ve heard some encouraging words from women who’ve been in my shoes before and while I never in my wildest dreams imagined I’d be a mother of three, certainly not in short order, this is real life and these are my legit feelings. So back to the potatoes, mhm? I suppose there’s not much else to say about them, other than my new excuse is ‘I’m eating for three!’ Should you be considering purchasing Tara’s book, let me assure you: it is one of the most well put together, creative, and inspired collections out there. 1. Preheat your oven to 400 degrees F and place one rimmed baking sheet (preferably heavy) on the center rack. Place another rimmed baking sheet on a rack just below. 2. 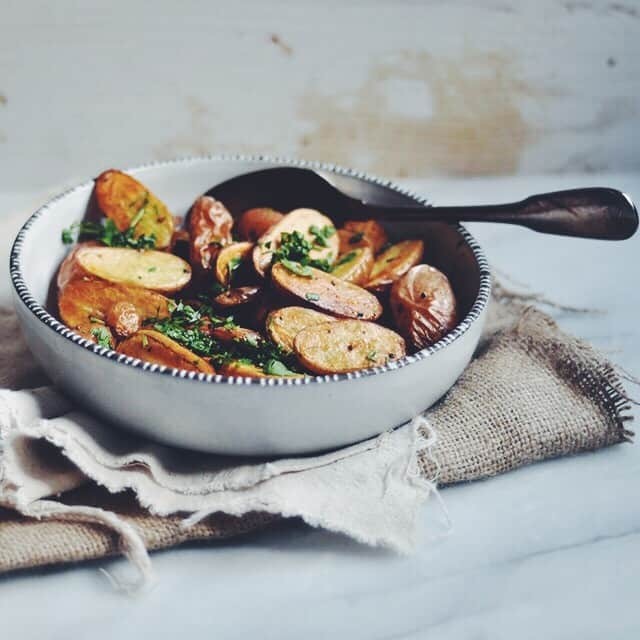 Slice the potatoes in half lengthwise, and toss them with the oil, pepper, and salt, in a large bowl. 3. Once the oven is hot, allow the baking sheets to sit in there for another few minutes. Remove the lighter baking sheet from the oven and transfer the potatoes, cut side-down, to the pan. Place the heavier baking sheet directly on top of the potatoes and slide in between the two oven racks. 4. Bake for about 25-30 minutes, or until the potatoes are golden and crisp (I actually chose to smoosh the potatoes once or twice with the tenting baking sheet to encourage the potatoes to flatten). 5. 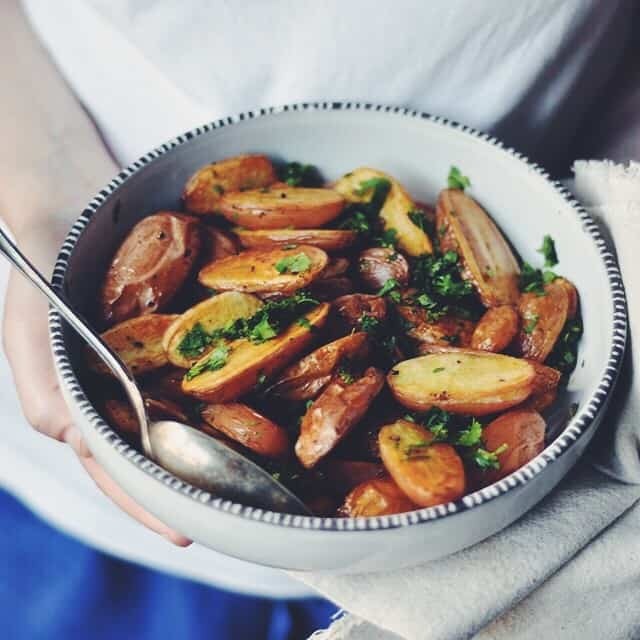 Remove the potatoes from the oven and transfer to a serving bowl. Add in the parsley or cilantro and toss immediately. Serve warm, accompanied by ketchup, aioli, or blue cheese dressing (recipe in Tara’s book).